"Famous for writing and editing several military books, he was placed in command of the Union Army's Western Department early in the war. He served as general-in-chief and as chief of staff later in the war." 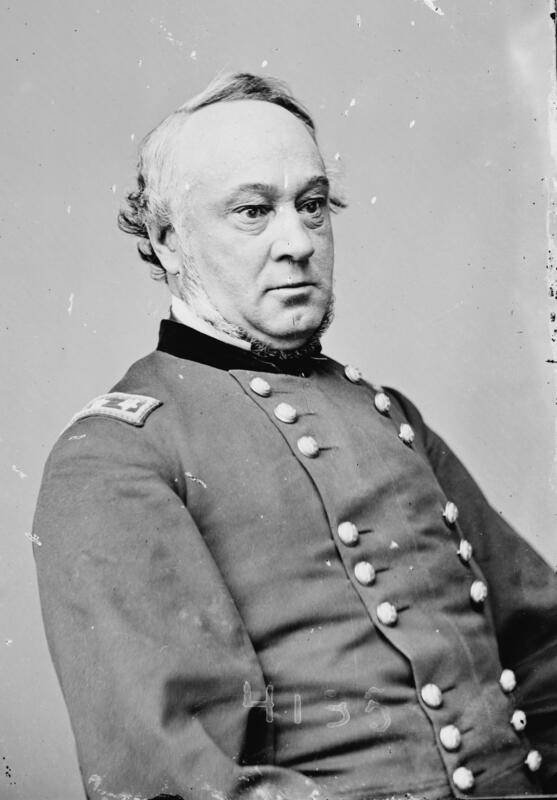 Henry Halleck was an intelligent, abrasive general of mixed ability. He could think and plan, but he couldn't make things happen in action. A West Pointer (1839) he graduated high in his class and went into the engineers. He fought in the Mexican War, earning a brevet, and then did many of the normal things for the intelligent engineers: he built coastal fortifications (protecting America against improbable invasion), taught at West Point, and studied the military art. He translated Henri Jomini's biography of Napoleon and also wrote a book of his own about military matters and national defense. He quit the Army in 1854, entering the legal profession in San Francisco and was part of California's Constitutional Convention. He didn't give up the military completely, but stayed active with militia units. Winfield Scott, senior general of the army, recommended Halleck for high command. When the senior general in an army speaks, people listen, and Halleck was immediately made a Major General (August 1861). His first job was to run the Department of the Missouri, messed up by the incompetent (but well-connected) John Fremont. Halleck was a good administrator, and cleared things up. He was Grant's superior when Grant and Foote captured Forts Henry and Donelson, a strategic victory that put the Confederates on the defensive in the western theater from the opening days of the war. Halleck was promoted on Grant's reflected glory, and was put in charge of all forces west of the Appalachians. His subordinates won further victories, Samuel Curtis at Pea Ridge, John Pope at Island Number 10, and Grant at Shiloh. Halleck's star rose with theirs, but it crashed when he moved out from behind his desk. He took command of three armies moving on Corinth, Mississippi. Eventually he took the town, but his advance averaged a mile a day as the ex-engineer insisted on entrenching at every step. The Confederates had plenty of time to evacuate everything of value. If ineffective, Halleck still managed to win promotion ' maybe only to get him away from field command. He was made General-in-Chief in July 1862, and moved to Washington. His strong administrative skills helped build armies from the mix of volunteers in the field, but he wasn't liked in the higher command. He felt he knew best, and that others should be puppets in his plans. So he never told them his intentions, only what they were supposed to do. Nor did anybody know what anyone else was doing. This led to bad co-ordination, confusion, and opportunities for the Confederates. It was clear Halleck wasn't the right man for the job, and in March 1864 Grant replaced him. But Halleck was too valuable to lose, and he was made Chief of Staff. This brought Halleck back down to his level of competence. He only had to execute plans that others devised. He still wasn't popular, but he was effective. After the fighting was over, he could again be trusted with field command. A week after Lee surrendered Halleck was moved down to Virginia and took command of the District of Virginia and the Army of the James (still leaving Grant with the Army of the Potomac in case it was needed in North Carolina). He continued in administrative positions during Reconstruction until his death, in command of the whole Division of the South.